Follow along as MPs sit the day following a violent attack at the National War Memorial and Parliament Hill, which left a reserve soldier dead. Many parliamentarians were locked down in Parliament's Centre Block for several hours. The House of Commons sits today in the aftermath of yesterday’s shootings at the National War Memorial and Parliament Hill that left a reservist dead. Cpl. Nathan Cirillo, a member of the ceremonial guard at the memorial, died in hospital after being shot. 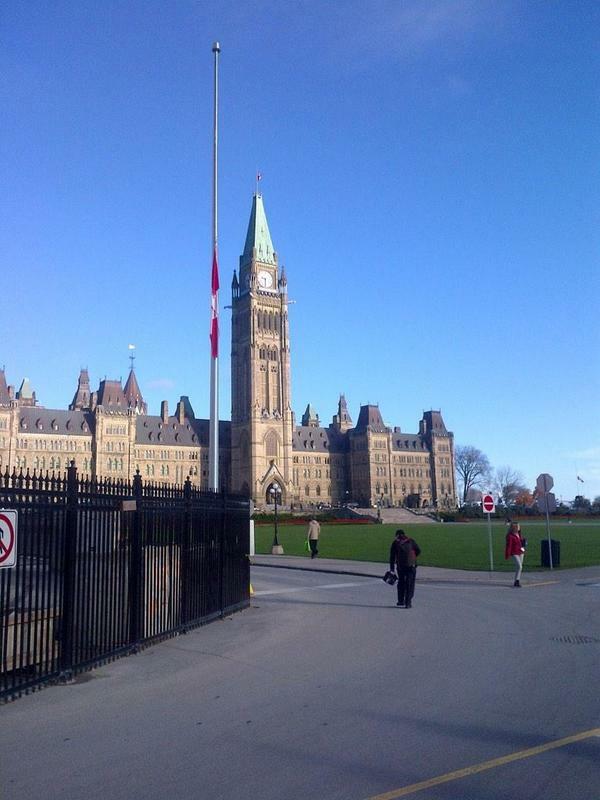 The shooter then moved to Parliament Hill, where security officials killed him. Instead of their normal Wednesday morning caucus meetings, MPs were placed under lockdown for several hours. Police cordoned off large sections of downtown Ottawa surrounding Parliament Hill. Other downtown buildings were also locked down. Prime Minister Stephen Harper visited the National War Memorial this morning to lay a wreath in Cirillo’s memory. La Chambre des communes siège aujourd’hui au lendemain des fusillades survenues hier au Monument commémoratif de guerre et à la Colline parlementaire. Un réserviste a été abattu lors de cet attentat. Ce matin, le premier ministre Stephen Harper s’est rendu au Monument commémoratif de guerre où il a déposé une couronne à la mémoire du caporal Cirillo. We will also carry today's Speaker's Parade into the Commons chamber, where Sergeant-at-Arms Kevin Vickers carries the mace. Martin Stringer is speaking with B.C. Conservative MP James Lunney about being barricaded inside a caucus room yesterday following the shooting. Lunney: "the pillars are still there" in the Hall of Honour. "Our institutions have to be defended." Reaction now from Minister of State (Democratic Reform) Pierre Poilievre. Poilievre: hearing gunshots, we thought there could have been several shooters involved. If you missed last night's statements by Prime Minister Stephen Harper and Opposition Leader Thomas Mulcair, you can watch here. "Immediately before a sitting commences, a ceremonial procession known as the Speaker's Parade makes its way from the Speaker's chambers along the Hall of Honour to the House of Commons Chamber. The procession is led by the Sergeant-at-Arms or his or her deputy bearing the Mace; he or she is followed by the Speaker, a page carrying the prayers for the Speaker's use prior to the opening of the sitting, the Clerk of the House and other Table Officers. As the parade enters the Chamber, Members rise while the Speaker makes his or her way to the Chair. The Sergeant-at-Arms pauses until the Speaker has taken the Chair, then places the Mace on the end of the Clerk's Table, bows and takes his or her seat at the Bar of the House. Once satisfied that a quorum is present, the Speaker reads the prayer, presides over a moment of silence and then opens the sitting. In the absence of the Speaker, the Presiding Officer for the sitting takes the Speaker's place in the parade. At the end of a sitting, the Speaker adjourns the House and then exits the Chamber, this time, through the doors behind the Chair, preceded only by the Sergeant-at-Arms bearing the Mace." We all need to stand together in light of these events.. especially as some 'small minded' comments are being made about our Muslim fellow Canadians. Despite yesterday's tragedy we must continue to reach out to all Canadians regardless of religion. "Juste avant le début de chaque séance, un défilé d'apparat qu'on appelle défilé du Président quitte les quartiers du Président et se rend à la Chambre des communes en suivant le Hall d'honneur. Il est ouvert par le sergent d'armes - ou son suppléant - portant la Masse. Viennent ensuite le Président, un page portant la prière que lira le Président juste avant d'ouvrir la séance, le Greffier de la Chambre et les autres greffiers au Bureau. "Lorsque le défilé entre à la Chambre, les députés se lèvent et restent debout le temps que le Président arrive au fauteuil. Le sergent d'armes marque une pause jusqu'à ce que le Président soit arrivé, dépose la Masse au bout du bureau du Greffier, fait une révérence et va s'asseoir à sa place, à la barre de la Chambre. Une fois certain qu'il y a quorum, le Président lit la prière, fait observer un moment de silence et ouvre la séance. "Quand le Président s'absente, le remplaçant qui présidera la séance prend sa place dans le défilé. "À la fin de la séance, le Président ajourne les travaux et quitte la salle par les portes qui se trouvent derrière le fauteuil, précédé uniquement du sergent d'armes portant la Masse." You should turn to CPAC. As Peter Van Dusen discusses, the parade is a daily occurrence when the House of Commons is sitting. If you can turn to cpac.ca and watch the Speakers Parade! We will not waiver! Large applause for Sergeant-at-Arms Kevin Vickers throughout the foyer and in the House of Commons as he delivers the mace. The ovation from MPs finally subsides, though they continue to thump their desks. There will now be a prayer by House Speaker Andrew Scheer. If you live in Canada and are not watching CPAC right now. Shame on you. Scheer tells House that Parliament being closed to the public must be a temporary measure, meets with applause. Scheer has ordered a review of security measures. This concludes Question Period and our live online coverage of the House of Commons -- but you can continue watching the proceedings at www.cpac.ca, the CPAC TV 2 GO app, and of course CPAC-TV. Thank you for watching.